I have a dream that one day I would be able to translate fast enough to promote the idea “more reading, less waiting.” But sadly, that’s not going to happen for a looong time. King Shura is up on novelsnao.com!! Go check it out if you have time. We’ll have about 3-4 side stories after this– 2-4 new characters are introduced. The one that’s introduced after this chapter will be extremely important in the near future, so I recommend you read it. I’ll try to blast through the chapters asap. I should really work on finishing that short story… and I don’t know what happened to the Reaper King…? I should really work on those. Gongson Chun Gi stroked his beard as he stared at his opponent. An old man with a feather fan. Gongson Chun Gi could feel that the man had immense pride based on the man’s arrogant voice. But the strange thing was, Gongson Chun Gi had never seen the man in his life. Zhuge Liang. He fingered the tip of his fan and smirked. It was as if he was astounded by the fact that Gongson Chun Gi even said such a thing. Gongson Chun Gi grinned in amusement. Who was this man? Why was a man like this even here in the first place? Quite a lot of questions floated atop his head, but he refrained himself from asking them. The questions were something that had to be resolved at another time. Zhuge Liang smiled, and nodded. Gongson Chun Gi grinned. That was just what he wanted. It should be alright to ask questions after defeating the old man. Zhuge Liang flapped his fan leisurely as he responded to Gongson Chun Gi’s threat. Gongson Chun Gi grinned like a child. This was just what he wanted. Moreover, he could feel the opponent’s immense pride from that answer. Just who, just who under the heavens could show this much pride to him? Gongson Chun Gi could feel excitement from this new experience. Gongson Chun Gi was filled with interest. While it wasn’t as much as martial arts, Gongson Chun Gi really was confident in magic. It wouldn’t be a lie to say that the thing he was best at after martial arts was magic. The Heavenly Demon Church has quite a lot of good magical techniques. They had an astronomical amount of it. Gongson Chun Gi, who read all of it out of boredom, knew about all the magical techniques the church possessed. Gongson Chun Gi never had a proper teacher, however. That was because even if no one taught him how to utilize his techniques in a more useful manner, his strength already rivalled that of a first-rate. What should he do first? Gongson Chun Gi could see that his opponent was very talented. If he used a weak technique, he’d just be humiliated. He needed to use an extremely powerful technique that could overwhelm the enemy with a single hit. Gongson Chun Gi thought about the technique he should use, but then frowned as if he had seen something. He stared at Zhuge Liang intently, and let out a small groan. Zhuge Liang’s arrogant eyes filled with surprise. What did he see? There shouldn’t be anything Gongson Chun Gi should be able to see here. Gongson Chun Gi stared at the old man in front of him for a while with a frown. Soon enough, he scratched the back of his head and smiled. Same calibre. Zhuge Liang smiled when he heard Gongson Chun Gi’s words, and shook his head. Zhuge Liang spoke as he lightly slapped his hand with his fan. Gongson Chun Gi grinned, and stretched out his right hand without any warning. It was as if he was trying to grab onto something. It was a simple and light movement, but this move actually contained a tremendous amount of energy. The air trembled slightly, and Gongson Chun Gi’s right hand disappeared into thin air. It was as if the hand fell into a shroud of fog and disappeared. Zhuge Liang, who observed Gongson Chun Gi’s moves, became amused. At that moment, the air in front of Zhuge Liang split open to reveal an empty black space resembling the entrance to hell. As soon as Gongson Chun Gi finished speaking, a giant blue hand appeared from the whole. A giant hand that resembled those of a corpse. That hand tried to grab onto Zhuge Liang and make the man explode. But…… When Zhuge Liang lightly flapped the feather fan, the hand exploded violently. A sound of a monster’s cry resounded from the hole, and the destroyed hand disappeared from the air. Gongson Chun Gi made a face of disappointment. He knew his opponent would be able to deal with his spell, but wasn’t this dispelled too easily? He wouldn’t be able to measure the opponent’s power this way. Right then, Zhuge Liang opened his mouth. At that moment, Zhuge Liang’s body began to emit a tyrannical aura. But Gongson Chun Gi wasn’t even fazed by this. Instead, he actually began to smile. Gongson Chun Gi nodded enthusiastically. He, too, knew that he wouldn’t be able to get his opponent without going all out. Gongson Chun Gi raised his arms, and rubbed his eyes lightly. That moment, the world brightened around him. When Zhuge Liang said this in a quite voice, a giant red eye appeared above Gongson Chun Gi’s head for a moment, then disappeared. Zhuge Liang looked down without finishing his sentence. He could feel something gigantic under his feet. The ground split in half all of the sudden, and rows of sharp teeth revealed itself within. Without any warning, the ground split apart widely. Gongson Chun Gi became elated. The giant mouth that formed on the ground opened its mouth widely, and swallowed Zhuge Liang. The sound of bones breaking apart could be heard from the darkness of the abyss. But Gongosn Chun Gi’s face, which had been staring at the ground for a while, slowly turned into a frown. He licked his lips and spoke. Gongson Chun Gi turned his head. When he did so, the space next to him swayed and revealed Zhuge Liang. Gongson Chun Gi scratched the back of his neck with a dissatisfied face. He then opened his mouth with an uninterested face. At first, Gongson Chun Gi assumed that he was inside Cho Ryu Hyang’s dream. But that wasn’t the case. This was a place created by that old man, Zhuge Liang. The old man was the one who had the advantage from the beginning. There was no way for Gongson Chun Gi to win if he and the old man were of the same strength. Gongson Chun Gi said this as he dispelled his Demon Eye. He then sat down on the ground with an extremely relaxed posture. Zhuge Liang grinned when he saw this. There was no way for Gongson Chun Gi to win in here. If the two met in the real world, then perhaps the result of the battle could be different. But here, there was no way for Gongson Chun Gi to win against Zhuge Liang. Zhuge Liang stared at Gongson Chun Gi for a moment. Gongson Chun Gi, too, stared at Zhuge Liang. The monsters of the past and the present. These two were constantly trying to pry into each other with their eyes. After a moment, Gongson Chun Gi grinned as he spoke up. Gongson Chun Gi nodded when he heard Zhuge Liang’s answer. The thing Gongson Chun Gi wanted to know about. It wasn’t something that important to Zhuge Liang. Because of this, Zhuge Liang decided to tell Gongson Chun Gi about what was going on. Zhuge Liang fingered his fan as he spoke. Gongson Chun Gi thought for a moment, then nodded. He finally realised what was going on. He also realised that the old man in front of him had no ill intentions towards Cho Ryu Hyang. Knowing that, Gongson Chun Gi could relax a little. Zhuge Liang smiled. As expected, this person wasn’t someone he could look at lightly. To think that the man could find out about that immediately. Gongson Chun Gi was honestly impressed. Just how strong would one have to get in order to perform such a thing? Zhuge Liang mysteriously smiled when he heard Gongson Chun Gi’s question, and waved his fan. Gongson Chun Gi frowned as he got flown back due to the energy that came from Zhuge Liang’s fan. He still had something he had to confirm, but he got chased out. Gongson Chun Gi gulped down the honeyed water Sunwu Jo Duk brought him, and ground his teeth. He lost. To be fair, he was in that man’s dream, but he was still filled with annoyance. After thinking for a bit, Gongson Chun Gi looked at his right hand. The skin on his right hand began to rupture, and streams of blood began flowing out. Sun Jo Duk, upon seeing this, widened his eyes and immediately applied medicine. He really wasn’t just dreaming. His right hand was damaged quite badly due to the old man’s attack just now. An attack to the consciousness, depending on its size, were able to show its effects on the physical body to an extent. If Gongson Chun Gi was damaged this much even when using the Demon Eyes, an ability that boosted the power of the consciousness several times, the technique the old man used must’ve been extremely terrifying. Gongson Chun Gi stared at his bleeding hand for a while, then turned to look at Cho Ryu Hyang. Sunwu Jo Duk asked this carefully, but Gongson Chun Gi didn’t talk. After all, the experience he had in Cho Ryu Hyang’s mind wasn’t too important. He simply looked at Cho Ryu Hyang and whispered quietly. Gongson Chun Gi felt that he suffered quite a bit. Zhuge Liang stared at Gongson Chun Gi from the space he had created. He then smiled when hearing Gongson Chun Gi complain. Zhuge Liang smiled as he fingered his fan. He was happy. Seeing someone with such talent made him happy. The man was amazing. It was hard to see such talent even back in his day, the age when countless heroes rose and fell. It’s been a while since he last enjoyed himself like this. He at first saw this meeting as a form of amusement. But even he never expected to have this much fun in this encounter. Watching Cho Ryu Hyang was already extremely enjoyable, but that child called Gongson Chun Gi was pretty interesting, too. While he had been smiling, Zhuge Liang could suddenly feel something break. When he turned his head to look at what happened, he froze for a moment. A part of the ground was ripped open completely. After surveying the area for a minute, Zhuge Liang made a dumbfounded face. To him, this face was an extremely rare expression that only came up in cases of extreme surprise. Gongson Chun Gi’s attack that swallowed him a while back. That attack had actually taken a chunk of Zhuge Liang’s space itself. Gongson Chun Gi. If that man attacked him with full strength, even Zhuge Liang, the owner of this space, would suffer quite a bit. He had thought that he thought highly of Gongson Chun Gi, but that wasn’t the case at all. It seemed that he was underestimating the man far too much instead. Zhuge Liang stared at the ground, and began to let out a hearty laugh without even realizing it. Aiya~ too fast! Are you just waiting all day in front of your computer for updates?! What do you mean by it’s up a novelsnao.com…..???? did you move there or….someone else is translating it…..???? I’m just posting the chapters there. woah—-??!?! that was utterly awesome! the meeting fo the two teachers, nice, nice! ooh, a fight! so cool—! bring zhuge liang out of that space? yes please! great! Idk why but I feel happy reading this chapter. Thanks for the quick chapter; I was not expecting another so soon. I was hoping he’d wake up in this chapter and I’d find out how this dangerous act was beneficial, but I enjoyed the Teacher1 vs Teacher3 confrontation. Hehe, don’t worry, I’m not about to close down the site any time soon. Never planned on closing it. Also, I don’t know if you don’t know this or not, but… adblock would help erase most, if not all, of the ads that appear on Novelsnao. why don’t you go to wuxiaworld…..??? that site has too much issues…. Exactleh. But wait, was this supposed to be a reply for someone? it’s fine as long as you don’t close this site…..
I’m not going to novels nao…..as I said before too much issues. SO, DON’T CLOSE THIS SITE, DON’T STOP POSTING CHAPTERS HERE. *squees* okay, well it was calmer than I thought, and I am so incredibly grateful that the author didn’t troll by changing to a sidestory right away. Thanks so much for all your hard work, I love this one!!! (with unholy love!!! I never saw zhuge liang like that. 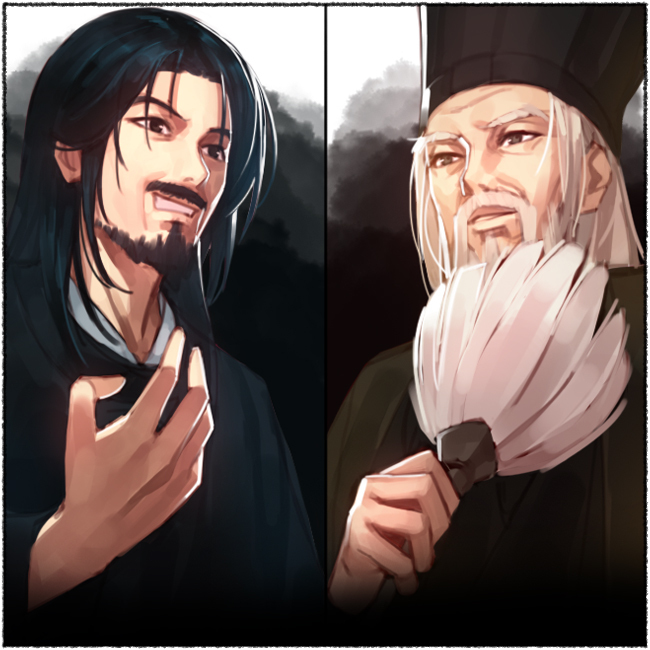 I always see him with the ROTK portrait lol: without a white beard and a perfect feather fan.